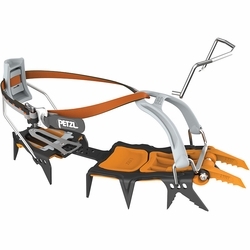 Petzl LYNX Crampon. Modular crampon for ice and mixed climbing, with LEVERLOCK UNIVERSEL bindings. With interchangeable front points, LYNX crampons adapt to diverse activities, from snow couloirs to dry tooling.